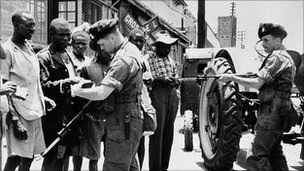 In July 2012 a legal case began in Britain to decide whether victims of gross human rights abuses in Kenya in the 1950s and 60s at the hands of colonial officials, police, and white settlers could sue Britain for reparations. I wrote about this case in my book Reparations to Africa (with Anthony P. Lombardo, University of Pennsylvania Press, 2008, pp. 57-59). As documented especially in the brilliant book by Caroline Elkins, Imperial Reckoning (Henry Holt and Co, 2005) these abuses were appalling, just as bad as the tortures, rapes and murders the Nazis had perpetrated on their prisoners in the 1930s and 40s, although the purpose was to prevent Kenyan independence, not to commit genocide. I believe that these Kenyan prisoners of British colonialists deserve reparations for torture, castrations, rapes, unlawful executions, and slave labour. They deserve reparations especially because the British were aware of the tortures and knew they had a legal responsibility to stop them. British officials tried to evade international and European Union laws protecting prisoners from abuse, laws that Britain had agreed to respect. The Colonial Office in London protected the governor of Kenya against complaints in the House of Commons from opposition members about the abuse and torture. These actions were illegal at the time and the perpetrators knew they were illegal. One form of reparation is financial compensation to the victims and/or their descendants. Another is to put surviving British murderers, torturers and enslavers on trial. Some of these elderly British men have admitted what they did, and there is precedent in the trials of elderly perpetrators for Nazi crimes, for example the trial of Maurice Papon in France. Even if such perpetrators were not imprisoned, they at least would be publically shamed.